Jamie Malone shone for Clare in Tullamore Photograph by John Kelly. 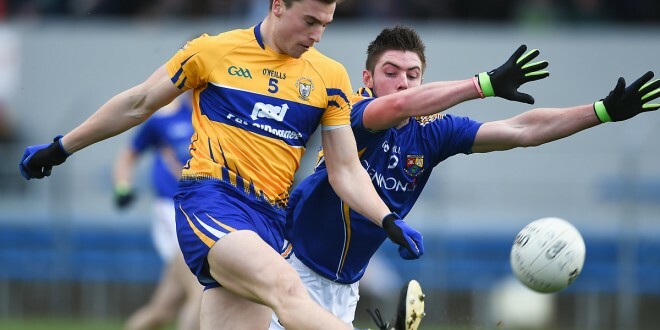 In Colm Collins’ near five year reign as Clare senior football manager, the team has provided many exciting games but few have been as entertaining or as nervewrecking as this afternoon’s clashwith Offaly in round 2 of he qualifiers. Before an attendance of 3 493 in blistering heat, this was end to end stuff and he result was in doubt right to the final whistle. Clare deserved their narrow victory and while Offaly can point to some missed chances, Clare can equally do he same and, arguably, to a greater number of missed opportunities. The Banner outfit had some outstanding performances and foremost for the visitors on the day were Jamie Malone and Eoin Cleary who, between them, accounted for 1-10 of heir side’s total. While Offaly had made the better start, they were fortunate to go to the interval on level terms with Clare. The midlanders had the better of matters in the opening quarter when the Clare defence was stretched to the limit at times. Ruairi McNamee punished a Clare error in the fourth minute when he finished to the net and the midlanders followed with two points to lead 1-3 to 0-2 after twelve minutes. Gradually Clare took a grip on proceedings and they bounced right back into contention in the twenty second minute when Jamie Malone found the net after being put through by Keelan Sexton. With Eoin Cleary now operating in the full forward line, Clare struck for three points in a row from the Limerick based Garda to lead by one with eight minutes remaining in the half. The visitors added a further three points to lead by four as half time approached and that lead could and should have been much greater as Jamie Malone split the Offaly defence wide open twice but his efforts rebounded off the woodwork both times. Then in the final move of the half Offal launched an attack and referee Paddy Neilan from Roscommor harshly penalised Pearce Lillis when awarding a penalty to the home side. Goalkeeper Alan Mulhall made no mistake and the game was level at 2-5 to 1-8 which was the position at half time. and then Clare hit three in a row to lead b y that amount with twenty minutes to play. Offaly brought it back to the minimum with fifteen minutes to go and this was sill the position as five minutes of ‘additional time ‘ were signalled.